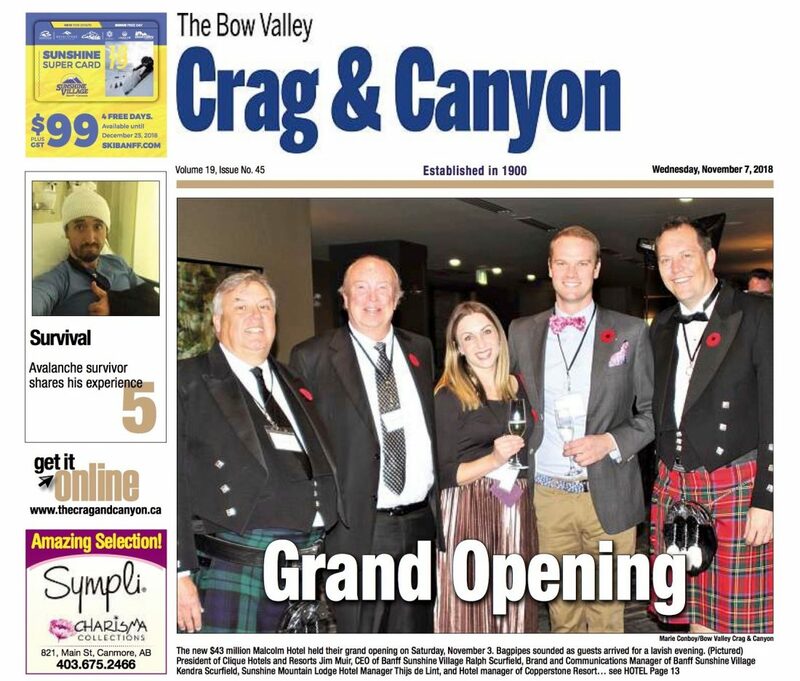 The Malcolm Hotel pulled out all the stops for their grand opening, as bagpipers played for guests who arrived on red carpet on Saturday, November 3. The new $43 million hotel is Canmore’s first four star luxury hotel, located in Spring Creek, it is operated by Clique Hotels. Speeches were heard from Spring Creek President Frank Kernick and Jim Muir, President of Clique Hotels and Resorts at the unveiling of the King Malcolm portrait in the grand lobby. The Malcolm is a traditional hotel inspired and named in honour of Malcolm, King of the Scots (1058 – 1093), it aims to reflect royalty, heritage, and pageantry of past Scottish kings as well as Canmore’s unique history and legacy. The hotel will feature a 6,600 sq. ft. of event space including the conference centre. Accommodations include 73 double queen rooms, 32 king rooms and 20 suites. Amenities include an elegant outdoor pool with panoramic views of the surrounding mountains from the second-floor open-air mezzanine and fitness centre.